Map by Lillie E. Hamm, public domain, with modifications by Miles Eggleston/North Coast Journal An 1890 map of southwest Humboldt County showing the original 1877 "Overland Route" wagon road south in red. 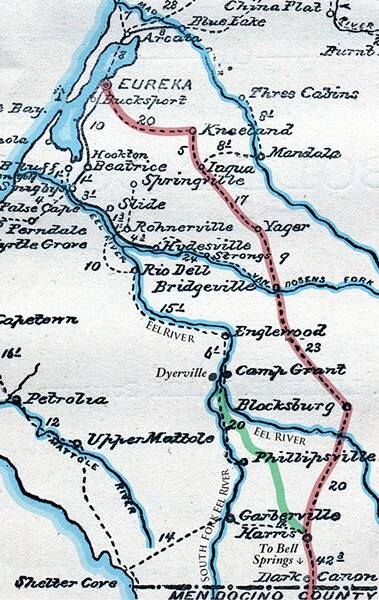 The green line is the more direct 1893 "Mail Ridge Route" (now Dyerville Loop Road) from the confluence of the main and south forks of the Eel (Dyerville) to New Harris. The 1918 Redwood Highway (and later U.S. Highway 101) follow the South Fork. If you drive or cycle the rolling mountain road from Bridgeville to Kneeland — it's a county right-of-way, despite all the "no trespassing" signs — you'll be following the first wagon route out of Humboldt to the south. Today, of course, we effortlessly zip along U.S. Highway 101, mostly along the South Fork of the Eel River, but 150 years ago pioneer road builders took to the hills. Follow the old 1877 Overland Route in red on the accompanying old map. Better yet, you can drive the entire route in a few hours, mostly on paved roads. From Humboldt Bay, wagons were hauled to Kneeland up the steep stretch of what is now Greenwood Heights Drive, before heading through undulating sheep-ranching country on today's Kneeland Road, mentioned above, and down to Bridgeville, the southern gateway into Trinity County to the east. After crossing the Van Duzen, the route followed today's Alderpoint Road on gentle grades to Blocksburg — then a thriving commercial center — and on to Alderpoint, where it crossed the main fork of the Eel. 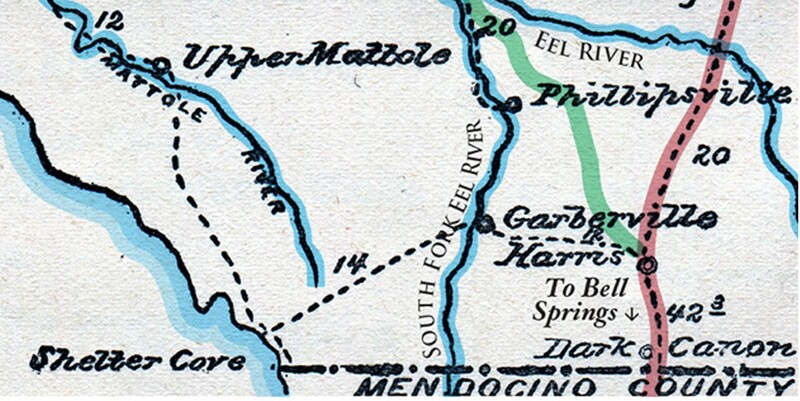 From there, the Overland Route kept on south to "Old" Harris, thence to Bell Springs after crossing the Mendocino County line. The county line is close to where road builders from the north and south connected the route in 1877. Today, Bell Springs Road, following along the south section of the old route, connects to U.S. Highway 101 at the Candle Works, 10 miles east of Leggett. Why did those pioneer surveyors choose this long, high route in lieu of today's quick 'n' easy run up the South Fork of the Eel? Mainly, to avoid the major slog of cutting a swath through redwoods, and the steep river banks. Anyone who's been thwarted in their travel plans by Confusion Hill (now by-passed) will appreciate the chronic erosion problems they would have faced. However, snow and rain made winter travel along the high route a challenge at best, impossible at worst. So just 16 years after the Overland Route was punched through, the county opened the much shorter Mail Ridge Road (in green on the map). This connected Dyerville to the Overland Route at what became New Harris, avoiding the entire Kneeland-Bridgeville-Blocksburg high country, although wagons still had to contend with one steep stretch between McCann and Fruitland. You can check it out for yourself on Dyerville Loop Road (which, despite the name, isn't a loop). The final route, preceding construction of U.S. Highway 101 in the 1960s, was the Redwood Highway, now the Avenue of the Giants for much of its route. Built between 1910 and 1918, largely with convict labor from San Quentin, it mostly follows the South Fork of the Eel. Why didn't it go along the more obvious main channel? Because that right-of-way had already been appropriated by what would become the Northwest Pacific Railroad. Which is another story, to be saved for a future column. Barry Evans (barryevans9yahoo.com) dreams of cycling along the Eel River canyon if the line of the Northwest Pacific Railroad ever becomes a public right-of-way.